ONE sail size. 40% is just a number right? 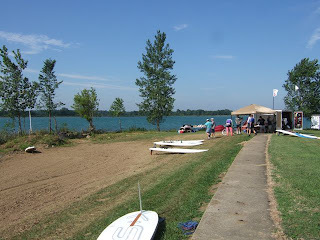 In mid July I traveled to the "Reservoir Rendezvous Regatta" in New London, Ohio. 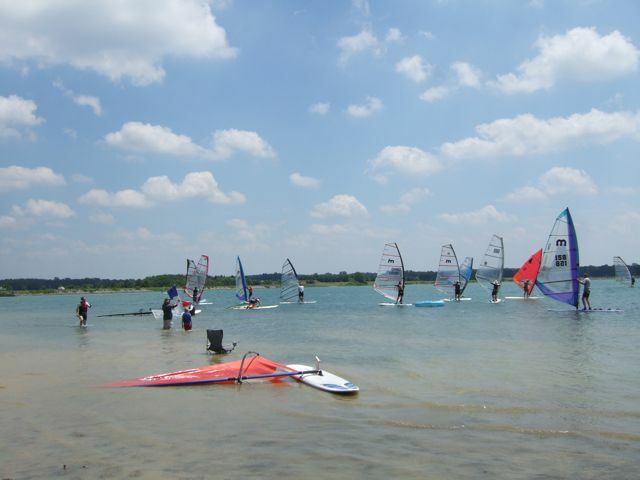 I really enjoyed this regatta because of the site, good sailing conditions and I was able to demonstrate how competitive an Original Windsurfer is, with just ONE sail size in a variety of conditions. 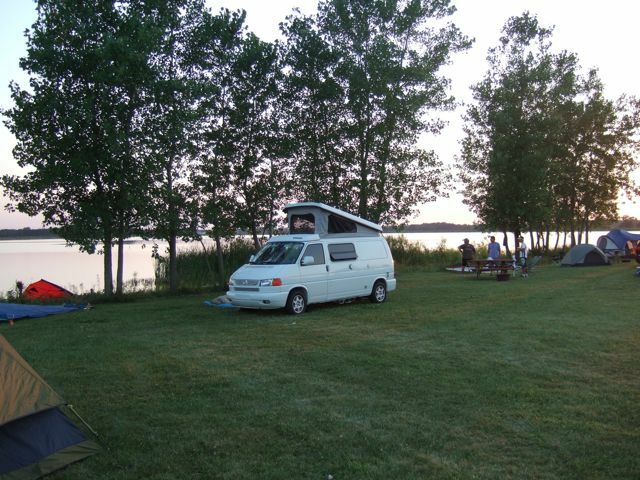 Photo: Camping next to the lake made this a great site. This is only my 2nd competition racing on the new Original Windsurfer so I am still measuring it's worth against other boards. Especially racing against other boards with sails that are 40% larger. "As the wind increased and I was in a constant planing mode, I wasn't overpowered like some sailors with big rigs"
I have to say it was a bit of a drive for me but it was worth it. The organizer, Phil Sage and his son Matt put on the event with help from the Town of New London. There was moderate and strong winds for the races both days and after a long day on the water Phil & Matt provided dinner and there was a big fire to gather around. Race photo 1: Before the start. Sometimes I do some freestyle before the start of the race, especially when the water is so nice and warm. Look! no harness. 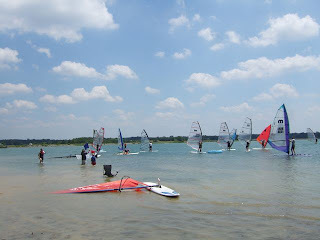 Race photo 2: Just after the start, the Original Windsurfer accelerates and points to wind very well. Race photo 3: Just because the other sails are larger doesn't guarantee they get off the line any faster. I believe this is because the larger sails are difficult to maneuver...but it could be the boards also. Race photo 4: 40% is just a number right? Race photo 5: Fleet is tight, no slackers in this group of racers. Race photo 6: Moments later after the first tack of the race, the Original Windsurfer is at front of fleet. 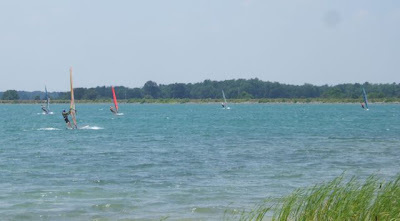 The Windsurfer can tack & gybe more quickly than any of the boards on the water that day, so every time there's a tack or gybe involved, I had an advantage. This is getting exciting... can I route for myself? 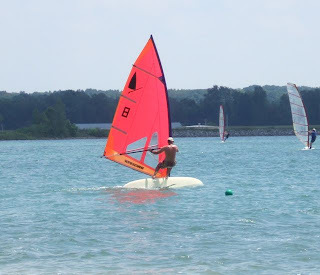 A couple people wanted to try my Original Windsurfer. One racer "Paul" even wanted to try a few races on it! So we traded boards and I raced his board for one race. It became clear I wasn't getting my board back from Paul so I relieved the organizer, Phil from Race Committee duties so he could get in a race, he was stoked and I was happy to help. 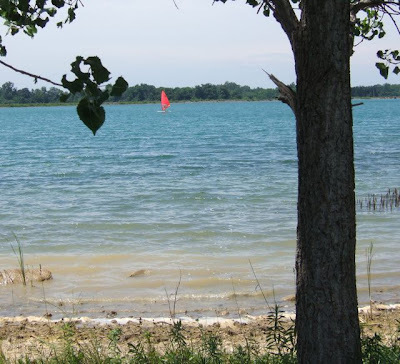 Photo: The next morning a new friend, Robin took the Windsurfer for a cruise around the lake. I think it was her first time on a long board, she said she was surprised with how responsive and fun it was to sail.